Sooooo…. I thought, since it is now June, that it might be a good idea to check and see how I’m doing on our book challenge for the year. So far this year I have read a book with characters from various socioeconomic classes (The Raven King by Maggie Stiefvater), A book by an Asian author (The Life Changing Magic of Tidying Up by Marie Kondo), A book by a woman author (Year of Yes by Shonda Rhimes), A book by a small press (Sad Girl Poems by Christopher Soto) , an audiobook (The feminist Mystique by Betty Friedan), and a graphic novel (with a superhero character.) (Y’all, I’ve read so much Captain America it ain’t even funny anymore.) That’s six out of thirty. I’m not even a quarter of the way done with the challenge. But, I have some things I’ve picked up that are in the pipeline that should fill out some of these categories. I hope. I just started Kindred by Octavia Butler, so that counts as a book with an African American character. Are you doing a book challenge this year? How are you doing on it? What have you read on the challenge that you loved but wouldn’t have read otherwise? All the feels! Re-reading this book just reaffirms how painful The Raven King is going to be. What’s the deal with Henry Cheng? I mean seriously? Maggie has already said he is going to play a bigger part in the next book but what? What was he doing out that late at night when Gansey and Blue run into him? Speaking of, is there ever been a more romantic non-kiss. It almost puts some actually literary kisses to shame! I want to know more about Persephone’s backstory. Actually I want a spin-off series that is just about Persephone, Maura and Calla. Hey Maggie, can you make that happen? Adam learned a very important lesson. That it is okay to ask for help and even if you don’t ask, if a friend offers it’s not out of pity but out friendship. Piper Greenmantle is not someone I would want to meet in a dark alley. That woman is truly scary. What is Gansey doing in the faculty lounge? Does he already know he’s going to die and this is him making plans? Why haven’t any written the Murder Squash song? I love how all-in Ronan is to being Supernatural. He’s owning is Greywareness! Also how touching was his revelation about Matthew? How he’s working on saving him. With what happened in the cave, do you think he’s figured it out. I like Blue and Ronan’s relationship. For all his guff, Ronan can’t help but care. He saved her from falling twice, once in the beginning of the book and in the end and then stayed behind in the dark to make sure she got to the other side. He’s a class act when he wants to be. What kind of man buries their daughter, face down in a grave for robbers to find? Maybe Glendower isn’t worth it after all. Never Scrying by yourself kids. So, we are now two weeks away from the release of The Raven King and the anticipation is just killing me. Will they find Glendower? Will Blue and Gansey finally kiss and will it kill him? Will Ronan and Adam kiss? Who is the third sleeper? Is it a huge spider because I am not okay with that! What has Neeve been doing all this time? I have so many questions that I hope to get answered soon. Dear readers, what are your questions for The Raven King? So it turns out that I never did a review of The Raven Boys. I guess that makes sense since it did come out in 2012 and well, Stacks did launch in 2012 but it took us two years to really get things going here. Check out Kate’s review and now a few observations. Richard Gansey III is smooth with the ladies, amorite? Blue’s and Gansey’s meet-cute may not be all that cute but it was pretty funny and a perfect set up to their relationship. Gansey is earnest but a little clueless but also shows how much both have changed throughout the series. On that note, Adam is a pretty smooth operator with the ladies. I love the way Ronan is described as he is more a sharp object then a person. Is Barrington Whelk the worst name ever? Neeve is shifty you didn’t have to be a psychic to figure that out. Does anyone else want a floor plan of 300 Fox Way? and Does anyone else want to live there? I do. Speaking of, I want to have drinks with Maura, Calla and Persephone and I’m not sure there is ever too much vodka. You have to love a book that features Welsh history and Latin as major plot points. Adam makes me so sad but I love him. He hasn’t excepted his situation as how things have to be and is doing something about it. I think he’s actually the best thing to happen to Gansey and Ronan. Blue is amazing. She is not afraid to stand up for herself. I also think she is the best thing to happen to Gansey. She challenges his perception of what it means to be poor. While Adam lives the life Gansey assumes all poor people live and life with violence and little love. Blue’s home life doesn’t fit that. It may be chaotic with all those women live in 300 Fox Way but it’s definitely a house full of love. Poor Noah. How many times did he tell people he was dead? Neeve will show up eventually. You think so? Adam what have you done? Next time you sacrifice yourself, know what you getting yourself into. How adorable is Ronan with Chainsaw? Speaking of Ronan, if you could bring anything from your dreams what would it be? Ok, now onto The Dream Thieves. It’s my favorite one so far. Also, 20 more days until The Raven King! Winter was the 65th new book I read this year. 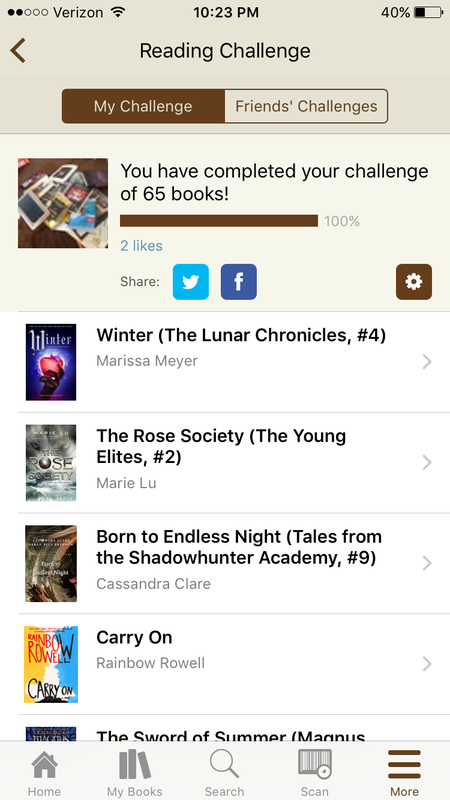 Thus completing my Goodreads challenge. I wish they would count all books we read because I know that I’ve read more books then this. I’m guessing It’s probably closer to 75 but whatever. I’m still happy with my progress. How is everyone else doing with their challenge? Don’t worry, you still got 6 weeks left on the year so plenty of time! You know when you are reading a book. You love it. You love the characters. You become invested in one or two of the characters. For this instance, you are involved with two. You want them together. You totally ship them. They are finally realized they are in love with each other and finally, FINALLY, do something about it. They are happy. You are happy. All is great and then realize that you haven’t even reached the half way point of the book and there are at least two more books to come. You start to panic because you know the happiness your characters feel now is not going to last that much longer. Something bad is about to happen. You accidentally read the synopsis of the next book in the series, so you know there is a death is coming. Now your even more frazzled because what if it’s one of your beloved! NO! It can’t be! They are HAPPY! Can’t they be happy? You want to turn away and stop reading but you can’t. It’s a like a car accident as much as you want to look the other direction, you can’t help yourself from looking straight ahead. So you keep reading towards the inevitable. Hoping for the best but bracing yourself for the worst. That is exactly where I am right now in the The Crown of Midnight. Something book is about to happen. I just know it and I’m not prepared for it. Nope, not at all. Pray for me brothers and sisters readers. GOOD NEWS!!!! LAIR OF DREAMS IS COMING!! Good News! Well good news for me. Lair of Dreams, book two of the Diviner’s series by Libba Bray is actually going to happen! Last November, I wrote about how the publishing date kept getting pushed back but Miss Bray confirmed on her blog that, Lair of Dreams has indeed been finished and will indeed be released this year! WOOHOO! I’ll forgive that the release date is even later then the last time I checked. Now the date is August 25 instead of July but hey what’s another month when I’ve already waited 3 years? So why am I so excited about this book? Well, the first book, The Diviner’s was amazing! Evie O’Neill has been shipped off to New York City to live with her uncle in the middle of the Swinging Twenties. It’s supposed to be a punishment but how could living in the greatest city in the world among the speakeasies, jazz clubs and Ziegfeld follies be anything but a reward. Evie gets caught up in a strange murder, when police consult with her uncle who is an expert in the occult. Soon she is using her strange power to help solve the murder and meeting other exceptional young people with powers of their own. It kinda has a little X-men type vibe. Like any moment, they are going to ban together and use their powers to fight evil! The setting is great. All the optimism of the twenties. The characters are all likable and real. Miss Bray doesn’t shy away from the race and social divide of the characters and make it part of the story. There is so much going on but it doesn’t feel cluttered. It also has so much to build on that I really can’t wait to see where Miss Bray takes it. So finally! Finally! I’ll get to find out! In the meant time people, Go read The Diviners before the Lair of Dreams comes out. I’m not normally the kind of reader (or person in general) that makes myself finish one thing before I start another thing. (Sometimes, I eat my dessert before finishing my peas.) I have no trouble starting a book right after I started a book. Back in the day, before there were ebooks and audiobooks that automatically downloaded to my fancy phone, this was easy to accomplish. I had the book on my bedside table and the book in my purse and the book in my backpack. I would read whatever was available. Now that I have ebooks and audio books (I still read physical books, though!) that will sync across platforms I don’t have the same excuse. So, now I just try to limit myself to one physical book, one ebook and one audio book at a time. Some days, it is really difficult, though. I have the audio book of Guy Gavriel Kay’s Under Heaven checked out from the public library. I have re-checked it out once and I only have it for another 9 days and I’m more than half way done. I’m really enjoying it! Every time I think, “Meh, I can see where this is going.” I get a section from a different character’s perspective and my theories are blown! It is really good! But, I am very excited that Mime Order is out and every bone in my body wants to start listening to it. Right now. I especially want to listen to it because I know Beth has finished it and is dying to talk about it. Ah, the frustration! Under Heaven is really good though. And, I imagine Mime Order won’t get stale waiting. Do you read more than one book at a time? How do you manage it? Have you put a book aside to get to something exciting you’ve been waiting for?